A synthetic leaf has been created that mimics the photosynthesis process, converting sunlight and water into a source of electrical energy. 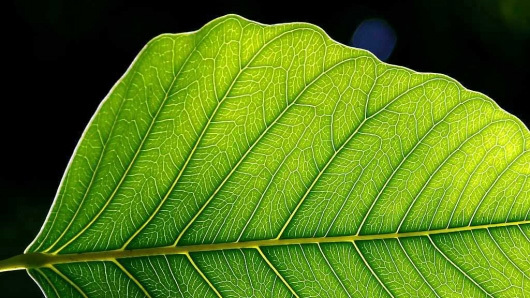 Developed by a research team at MIT led by Dr Daniel Nocera, the leaf could be a significant step towards green energy becoming a sustainable reality. The device is shaped more like a playing card than a leaf, but is thinner and made from silicon. If it is placed in a gallon of water in bright sunlight, the artificial leaf splits water molecules into their component gases: hydrogen and oxygen. Tap those gases in a fuel cell and you have a means to turn the leaf's output into electricity – and enough of it to power a typical developing world house for a day, Nocera reckons. This isn't the first attempt to make an artificial leaf – boffins at London's Imperial college have had a go before – but it is the first that could be widely used. The key is Nocera's use of inexpensive catalysts, made from nickel and cobalt, which efficiently electrolyse the water in the presence of sunlight. In testing, he showed it could operate for a continuous 45 hours without a hiccup.